With elegant styling and superior functionality, this Seiko Le Grand Sport Solar watch is a beautiful timepiece. 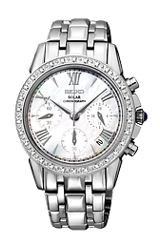 This watch features a mother-of-pearl dial and a stunning diamond accented bezel. But don't let any of that fool you, it's one of the finest and most functional timepieces available today. This all new SEIKO Ladies LeGrand Sport is SOLAR POWERED, it runs on light with no batteries to replace! Seiko's Solar watch takes its energy from light and stores it in a self-recharging battery. The watch features a Chronograph or stopwatch style movement. There are three subdials which show 24 hour time, a continous second hand and a 60 minute chronograph subdial. Ensuring accurate time keeping, SEIKO's legendary quartz movement assures superb accuracy. The watch is constructed entirely from Stainless Steel and has a virtually scratchproof Sapphire Crystal. The watch is also water-resistant to 100 meters (330 feet) below sea level.